« Suspicion and the Corruption of the Liberal Mind. They also played a couple (unnecessary) covers.. this one was from “Stairway to Heaven” where a religious icon (of sorts) was walked through the main floor seated area by some monks in robes. They covered “Space Oddity” by David Bowie, as well. The show could have been about 45 minutes shorter and just as good, but I’ve got to hand it to Billy Corgan and crew, they try to give the fans lots of music. James Iha even joked about how long the show was going to be when he introduced the band about 1/2 way through. 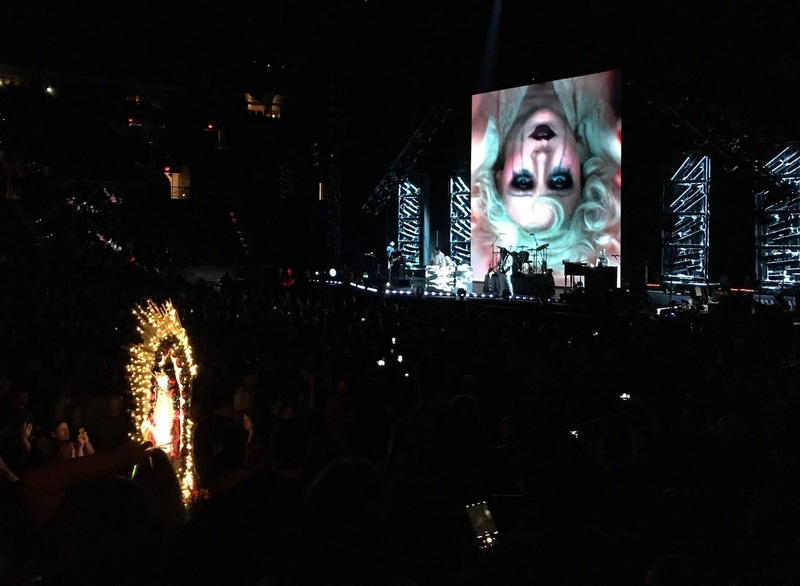 There were some articles I read about low ticket sales for the Smashing Pumpkins tour but the Moda Center seemed pretty crowded – the floor was sold out and the first level seemed full. They did block off some of the top sections. The fans were definitely into the show and happy to be there. The first time I saw the Smashing Pumpkins was back in 1991 when they played on tour with the Red Hot Chili Peppers and Pearl Jam. Thanks to the internet we found the ad from 1991 at the Aragon Ballroom (below). Like all the shows back then, we pre-partied a lot to save money so it is kind of hazy; I definitely remember Pearl Jam going on first and Eddie Vedder dove from the stage into the crowd which was quite impressive – he had to run fast and hurl over the gap between the stage and an empty area to reach the fans. I wasn’t expecting that. 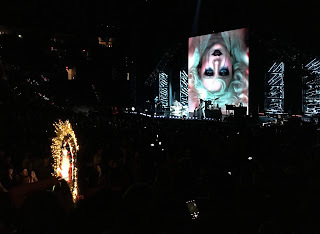 The Smashing Pumpkins came up next – I knew some of the songs from Gish (I particularly like “I am One”) and they played a couple off Siamese Dream which either wasn’t out yet or I didn’t know any of it. Then the Red Hots came out – they were lowered from the rafters and wore helmets that shot flames – and the whole place turned into a big mosh pit. It’s been a long strange ride for the Smashing Pumpkins and it was a great show, although if you weren’t a Smashing Pumpkins fan you would definitely get a “Spinal Tap” vibe due to Corgans’ pretentiousness. I guess now due to my age Smashing Pumpkins are basically classic rock nowadays. This entry was posted on Monday, August 27th, 2018 at 9:37 pm	and is filed under Music, Oregonia. You can follow any responses to this entry through the RSS 2.0 feed. Both comments and pings are currently closed. Never really cared for them. Too mopey and pretentious. But they did have some great songs. And reading this I was struck by the fact that they were the biggest rock band on the planet for a few years in the mid 90s, back when that still meant something, and yet they are nonexistent on “classic rock” radio. You’d think Collective Soul was a way more important band based on current radio playlists of songs from that era. It’s amazing how distorted our view is of times that are only a couple of decades in the past. I think Billy has been blacklisted in the rock world for a long time, and especially since he got into pro wrestling and hooked up with the right web crowd. He’s a weirdo, but I like him. Most of what passes for theatricality nowadays is just cynical political advocacy. At least he’s coming at it from an entirely different angle. Count me as one of those who finds Corgan’s woe is me attitude grating, but nevertheless they do have some great songs. Make the Pumpkins Grate Again. 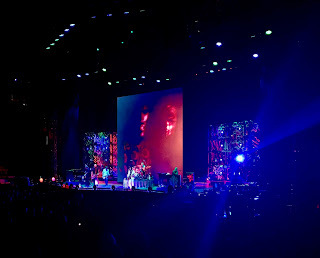 Way back in the stone age, I saw the Beach Boys in concert. This was before they connected w/Chicago (CTA, forever!) and were past their initial sell by date. I thought it was one of the saddest concerts I ever went to. The audience seemed to think they were on the nostalgia circuit already, even though that hadn’t been invented yet. They tried to play new stuff (a fabulous version of “there’s a riot goin’ on”), but all the audience was able to ask for was “Help Me, Rhonda”.